The bust foiled an alliance of Mexican outlaws that threatened to wreak havoc on Southern California. In one of the largest single crackdowns on organized crime in L.A. County history, a major drug raid Tuesday netted nearly $20 million in meth, and the arrest of eight accused gang members, busting up what federal authorities called an alliance of Mexican outlaws that threatened to wreak havoc on Southern California. A multi-agency task force raided areas in Montebello, describing the operation as a major salvo in a 20-year federal fight against the U.S.-based Mexican Mafia prison gang. Agents from the DEA and ATF partnered with local law enforcement to nab the suspects, who were key to an alliance being forged between the Mexican Mafia, known as La Eme, and La Familia, a Mexican drug cartel that has made inroads into the illegal drug market in the U.S. in recent years. The illicit pact, dubbed "The Project" by gang members, would have seen La Familia provide a steady supply of meth to La Eme each month to sell throughout Southern California, according to Sarah Pullen, a spokeswoman for the U.S. Drug Enforcement Administration. In exchange, La Familia was promised free reign on the streets and protection in prison, said Steven Bogdalek, special agent in charge with the Bureau of Alcohol, Tobacco, Firearms and Explosives. In addition to the arrests, police seized an array of handguns and other firearms and about 600 pounds of meth which had been accumulated over a span of three years, estimated to have a street value of $19 million. “Our joint efforts have helped disrupt the plot that could’ve flooded our neighborhoods with tons of methamphetamine and other narcotics,” said U.S. Attorney Andre Birotte Jr. “We have put to an end an alignment of criminal organizations that would have been unprecedented." Before Tuesday’s bust, the DEA had indicted 13 people in connection with “The Project” and arrested five others. After Tuesday’s arrests, all but one are in custody, according to Pullen. The final gang member under indictment is believed to be hiding in Mexico. 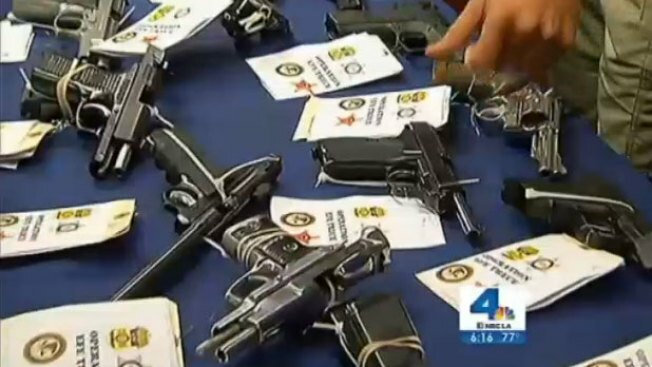 “We believe that we have initiated a crippling effect to those members who are still loyal to the Mexican Mafia criminal organization,” said Los Angeles County Sheriff Lee Baca in a statement issued by the ATF. In a separate indictment, the ATF named 31 street gang members charged with crimes ranging from possession of firearms, drug offenses, aiding and abetting, racketeering and conspiracy. They all face life in prison without the possibility of parole. The last large-scale crackdown on the Mexican Mafia in Southern California occurred in Orange County in 2007, when 100 members and associates were charged. Five were sentenced to life without parole in federal prison.